Spike Lee’s “BlacKkKlansman” stunned audiences with an untold, incredible true story set amidst the racial tensions of 1970s America involving the Ku Klux Klan. Less than a year later comes “The Best of Enemies”, a softer, but just as surprising, real-life story about 70s race relations and the KKK. 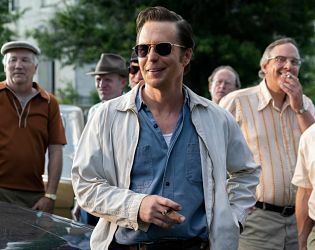 Sam Rockwell won an Oscar for 2017’s “Three Billboards Outside Ebbing, Missouri” and was nominated again in February for “Vice”. His performance here as Durham, NC Klan leader C.P. Ellis is stronger than those other two—combined. When a black elementary school in Durham is damaged in a fire, the town, dominated by white supremacists, must consider whether those students should be allowed finish their school year at the city’s all-white school. When that proposal is shot down by the white, all male town council, the NAACP steps in, forcing the governor of North Carolina to also step-in. But instead of handing-down a ruling, the mayor sends a mediator to Durham to set-up a charrette—a public forum allowing both sides to have their say and try to resolve the conflict. Following the 2-week charrette, a 12-person committee will vote on the proposals set forth. And their decision is legally binding. Ellis is chosen to lead the anti-segregation side. Popular Durham black rights advocate Ann Atwater (played by Taraji P. Henson) leads the opposition. The trailers and posters make “The Best of Enemies” out to be a personal showdown between Ellis and Atwater. And that is the case in some parts of the film. But even though Henson receives top billing, Rockwell gets twice the screen time. And that’s because “The Best of Enemies” is really the C.P. Ellis story. He is the person who grows throughout the film and has a real arc. Atwater is there to guide him along the right path. Henson is solid, and she has a few spotlight moments, though she doesn’t step far outside her work in 2016’s similar (to a fault) “Hidden Figures”. “Enemies” is very episodic, comprised of about 100 short scenes. Most are necessary, though the simple story feels overly complex at times. Writer/director Robin Bissell also incorporates some questionable music choices, along with a forced-in John Legend song in the end credits. Stories about segregation, such as those depicted in “BlacKkKlansman”, “Hidden Figures”, “Selma”, “42”, “The Help” and “Hairspray”, are obviously important to tell. But because their themes strike similar chords, each new movie that comes along can’t provide the same impact as the previous one. “The Best of Enemies” is a film I haven’t seen before, yet I feel like I have. If it had been released five or six years ago, it undoubtably would have a more powerful effect. Still, this is an admirable effort, with fine performances, and messages and lessons that are worth reinforcing—again and again. On The Official LCJ Report Card, “The Best of Enemies” gets a B-.